London and Dublin have clashed over whether the Brexit agreement intended to trigger trade talks is legally binding or not. The dispute was sparked when Brexit Secretary David Davis insisted it was much more a statement of intent than "legally enforceable". The Irish government responded strongly, stating the deal was "binding" and it would hold the UK "to account" on it. The document on legacy issues like the Irish border was hammered out in order to allow the remaining EU27 states to approve Brexit talks shifting to a phase two trade negotiation at a summit this week where Dublin wields a veto. Irish Taoiseach Leo Varadkar heralded the last-minute deal meant to prevent the return of a hard border between Northern Ireland and the Republic as "politically bullet-proof" and "cast iron". The Irish government's chief whip, Joe McHugh, branded the Brexit Secretary's comments as "bizarre". He told RTE: " We will as a government, a sovereign government in Ireland, be holding the United Kingdom to account, as will the European Union. "My question to anybody within the British Government would be, why would there be an agreement, a set of principled agreements, in order to get to phase two, if they weren't going to be held up? That just sounds bizarre to me. Mr McHugh said the Irish government would not "back away" from the Brexit principles if it comes under pressure from the rest of the EU during trade talks with the UK. 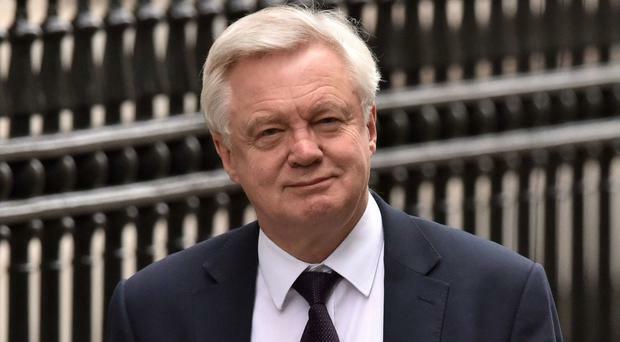 In the wake of some Brexiteers expressing concern the agreement said the UK would have "full alignment" with the EU on regulations and standards that impacted on Northern Ireland, Mr Davis told BBC1's The Andrew Marr Show: "This was a statement of intent more than anything else. "Much more a statement of intent than it was a legally enforceable thing." The comments came after reports that some hardline Brexiteers had been assured by the Government that the term full alignment was "meaningless". Mr Davis said the chances of Britain leaving the EU without a trade deal have "dropped dramatically". The Cabinet heavyweight insisted the agreement with Brussels to trigger talks on a post-Brexit relationship made the prospect of the UK being forced back into World Trade Organisation (WTO) tariff arrangements after withdrawal much less likely. The Brexit Secretary said: "The odds, as it were, against a WTO, or no deal outcome, have dropped dramatically." Mr Davis said a trade deal was "not that complicated", and suggested a version of the agreement the EU made with Canada, which he dubbed "Canada plus, plus, plus" because it would include areas such as financial services. The Brexit Secretary also insisted Britain will not pay a £39 billion exit bill to Brussels unless there is a trade deal. The comments appeared to contradict those of Chancellor Philip Hammond who has said it would be "inconceivable" the UK would fail to honour its international obligations. Pressed on the Chancellor's remarks regarding the exit payment, Mr Davis said: "No. It is conditional on an outcome. I am afraid that wasn't quite right. "It is conditional. It is conditional on getting an implementation period. Conditional on a trade outcome. "No deal means that we won't be paying the money." The Brexit Secretary insisted the UK would keep a "frictionless" border with the Irish Republic even if there was no trade deal. A Government source said: "There is no question of our commitment to the text of the joint report. "Ministers, the Irish government, and the European Commission all agree that it is the withdrawal agreement itself which has status in law."